We will write a Manifesto that aims to describe in simple and understandable words both the fissures within the regime or relations of ruling as well as the necessity to work for another Europe: a Europe of solidarity and real democracy, a Europe from bellow and with a social infrastructure for all. Such a Europe cannot be a Europe of debt and so called “debt brakes” or a “black zero” (these are all budgetary not social terms! ); it cannot be a Europe of borders and isolation, of commanding and blackmailing. It is and has to be a Europe for all and of solidarity. Hereby, we aim to intervene into the prevalent, forcefull narrative of a neoliberal Europe that seals itself off and and is desintegrating by the dictate of austerity. We recognize activities that are already happening (for example “City for all” initiatives, defencing, transnational social strike…) as part of Blockupy, issue calls and will participate in these as activists. The activities will be a part of our next offense and our politics of pinpricks. 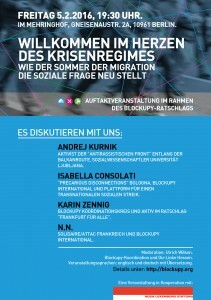 In order to use the political space Blockupy has created for common events bringing together the many we plan to mobilze to Berlin in the fall of 2016 – perhaps with parallel activities in other European cities (as in the “May of Solidarity” we called for in 2014) – whether as a festival with actions or in form still to be decided. We are suggesting to hold a European wide summit in Berlin in the first quarter of 2017 (maybe on March 18). We want to mobilize European wide to a summit in Berlin – a summit of the precarious, the excluded, the youth of Europe, in order to send a strong signal to the year of the (German) federal elections. It might be a (German) federal election. However, it won’t be a simple German matter since we all know that a German election has severe impact on European politics and people and thus needs to be seen as a European matter. We have to be clear: Blockupy is not only crucial for those activists directly involved. No, many contributions emphasized the significance of Blockupy as a crucial protagonist and as a common space in and for European struggles: a space of collective civil disobedience, a space of intervention. However, what could be the the right place to act in the future? And yet, whether it will be Brussels or Berlin or anyhwhere else, we are determined to continue to organize our activities on a European scale against the “state of fear” or the “politics of fear”. And, we will not only highlight the variety of European conflicts with one single “event” but will continue to trouble this Europe with our frequent actions. The overall right wing rollback In Germany primarily characterized by the growing mobilization of the right wing populist party AfD [Alternative for Germany], Pegida [regional mobilizations of so called concerned citizens], the increasing neo-Nazi mobilisations as well as the general shift of the societal center to the right. The next activist meeting (in April/May) will be crucial to relaunch the political and work process: everybody is invited to participate in the newly created work groups so we can get back to work quickly. Concerning all the upcoming activities we are determined to cooperate with many more people, networks, organizations and will approach them to get involved in the organisation process. To broaden our societal composition we fruthermore understand local platforms and organisations as places of concrete work on the ground, as coming togtehers and crucial organisational work. Blockupy is a local and territorial, a European and transnational protagonist as well as a lively alliance. Hence, there is a transnational dimension on every local level to be worked out. Hence, the European, transnational, territorial networking needs to be continued and intensified: let’s listen closely to each other, let’s find common points, let’s plan together and let’s strengthen us mutually e.g. through common actions, events, agreements. Now, after the period of reflections and a feeling of helplessness in view of the brutal European politics of those last months, a new dynamic is emerging once more. We can see this in the solidarity practices in all these places, we can hear this in the newly surfaced European terrain. So let us start again! There’s a lot to be done!